Houthi group has threatened that any member of the Yemeni Parliament attends the session, arranged by the official government in Seyoun, would be held accountable and charged with "gross treason". The Houthi-formed supreme political council has ordered authorities to take legal actions against all those found to have participated in the session, the Sana'a-based Saba quoted Houthi official as saying. The meeting seeks to breed illegal duplicate of the Parliament in order to legitimize war on Yemen, the official added, dismissing the session outputs as invalid. Early on Thursday, a Houthi drone was downed in Seyoun (venue of the session) by the Saudi-led coalition air defense, said the Saudi al-Arabiya TV. According to media reports, Houthi forces have intensively stormed into houses of MPs loyal to Yemeni government in rebel-held areas. Houses of the MPs Sultan al-Barakani, Sultan al-Etwani and Sakhr al-Wajeeh and of intelligence form head Hamoud al-Sofi have been raided by Houthi forces, said political sources and eyewitnesses. Late on Wednesday, Yemeni President Abd Rabbu Mansour Hadi called for parliament session in the eastern governorate of Hadhramout, under a decree carried by the Aden-based Saba. The Yemeni Parliament is expected to convene in the few coming days, after Hadi had failed to hold the session in Aden, seat of the internationally recognized government, following rejection and threats by the Emirati-backed southern transitional council. If held, this would be the first parliament session out of the Houthi-held Sana'a since the war start in March 2015. Two MPs have managed to flee rebel-held areas and joined "legitimate" government, informed sources told al-Arabiya. "Yahiya Mohamed Ali al-Matari and Mohamed Ali Ahmed Sewar, representing the two constituencies of 216 and 217 in Sana'a governorate, arrived Wednesday in Seyoun to take part in the session," said the sources. The Yemeni Parliament has been experiencing division following the war, with most of its members in Houthi-held areas holding semi-regular sessions in Sana'a, including Speaker Raa'i. But their number has increasingly declined after former president Ali Abdullah Saleh was killed in his house by Houthis on the 4th of December, 2017, two days after he had declared his GPC party's disconnection from partnership with Houthis and called for uprising against the group. Saudi Patriot-equipped and Yemeni presidential guard forces arrived Saturday in Seyoun to secure the session. Earlier, parliament sources confirmed that 140 MPs, 90 of whom in Riyadh and 50 in Yemeni provinces, would attend the session, according to the Saudi Okadh paper. 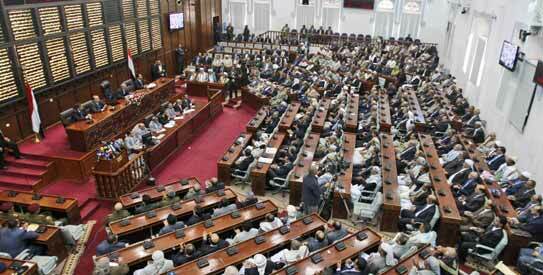 The session requires the quorum of 137 MPs to be held, said the sources. "Parliament blocks have agreed to form a presiding board chaired by Sultan al-Barakani as speaker, Mohamed al-Shadadi as deputy and Muhsin Basera and Abdul Aziz Jubari as second and third deputies," said Mohamed al-Himiari, the official minister for Parliament and Shura affairs.